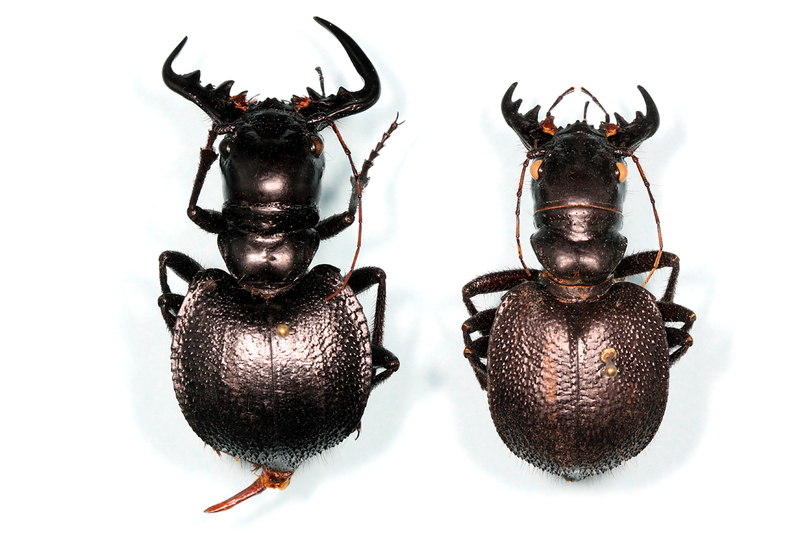 In the case of these beetles, the term “giant” is no exaggeration. The male specimen (above and left) measures a full 54 mm (that’s more than 2 inches, folks!) from the tip of its grossly enlarged mandible to the tip of its abdomen, and even the female at 47 mm length is substantially larger than my 38-mm long male specimen of North America’s largest tiger beetle, Amblycheila cylindriformis. 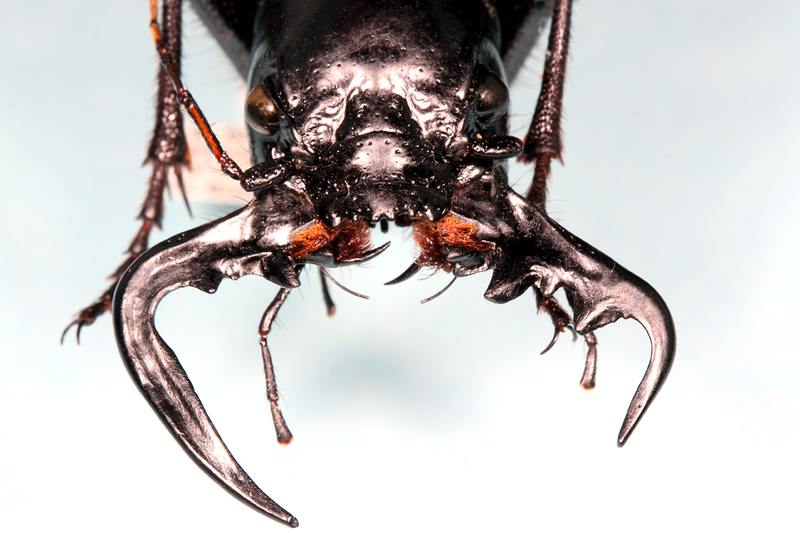 While enlarged male mandibles are a common feature among many beetle groups, Manticora males feature an unusual asymmetry in the mandibles, with the right mandible always much larger than the left (itself enlarged compared to the female mandibles, and even the latter cannot be considered small). Apparently the asymmetry represents a trade-off in natural selection—males use their mandibles not only to hunt prey but also hold onto the female pronotum during mating and subsequent mate guarding. There is positive selection pressure for larger mandible size, as males with smaller mandibles are more likely to be dislodged from the female by competing males. However, because of the large size of the species, larger male mandibles are less effective for securing normal prey items that tend to be smaller in size. If both mandibles were enlarged to the point needed to securely grip the female pronotum, the male would be unable to feed adequately, but having only one mandible fully enlarged provides sufficient grip while maintaining an ability by the somewhat smaller left mandible to grip regular prey items. A consequence of the mandibular asymmetry is that males ride “to the left” when coupled with females. The right mandible is larger than the left mandible. David identified these individuals as the species M. scabra, occurring throughout much of southern Africa (Botswana, Malawi, Mozambique, Republic of South Africa, Tanzania, Zimbabwe—according to Carabidae of the World). I presume the species epithet refers to the roughened surface of the elytra. There are at least two recent treatments of the genus (Werner 2000, Mares 2003); however, I have access to neither because of the exorbitant cost of these books—$247 and $433, respectively (I find it rather ironic that the recent explosion of book-sized treatments of “large” beetles has resulted in publications priced so high that they are inaccessible to most professional entomologists). Female mandibles are nonetheless impressive despite their smaller size. I made a trip to South Africa in 1999 and had hoped to see these beetles for myself, but unfortunately this did not happen. Perhaps part of the problem was my impression of these beetles as nocturnal hunters—the prevailing ‘wisdom’ at the time. My field partners and I made several nighttime forays in the semi-arid bushveldt where we were camping, using flashlights to scan the ground for any large black beetles we could find moving about. We found numerous tyrant ground beetles (family Carabidae, genus Anthia) and a diversity of tok-tokkies (family Tenebrionidae), but no Manticora tiger beetles. Shortly after that trip, Oberprieler & Arndt (2000) published an informative summary of the biology of several Manticora populations in South Africa, their most notable finding being that adults are opportunistic diurnal predators that hunt by smell rather than nocturnal visual hunters. Perhaps someday I’ll have another opportunity to visit South Africa and see Manticora adults in the field, but until that time I’m happy to have these two specimens residing in my cabinet. My sincerest thanks to David Brzoska for these sending me these fine specimens and for the many additional kindnesses he has extended to me during the past few years. Werner, K. 2000. The Tiger Beetles of Africa (Coleoptera, Cicindelidae) Volume I. Taita Publishers, 191 pp. This entry was posted in Cicindelidae, Coleoptera and tagged beetles, entomology, insects, nature, science, South Africa, tiger beetles. Bookmark the permalink. Cool beasts! 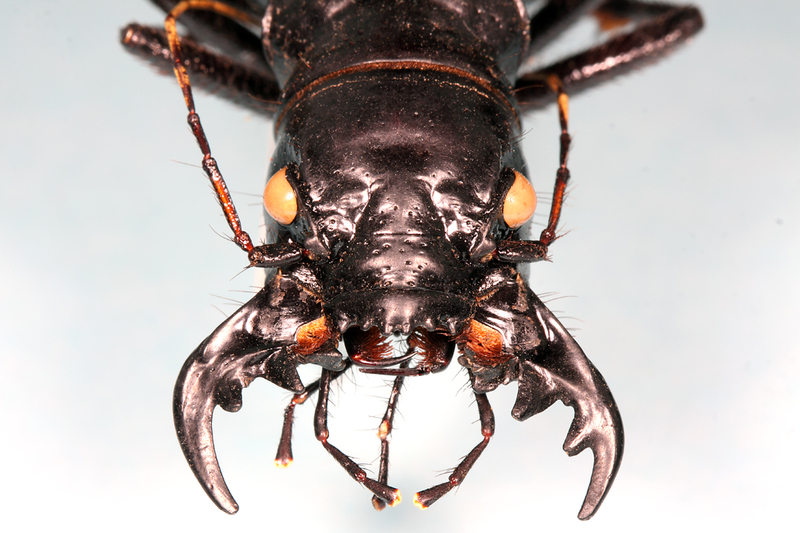 I’m suprised these guys aren’t referred to as sabre-toothed tiger beetles…. That’s a good one, but I think TGIQ’s comment below suggests another good alternative – “African Ginormous Tiger Beetles”! Wow! I was curious how big the larval burrows are, and found my answer in Oberprieler & Arndt: “Holes of the first instar have a diameter of about 4-7 mm, of the second instar 8-10 mm, and of the final instar 12-16 mm.” So the first-instar burrows are as big as any third-instar burrow I’ve ever seen in North America. Even more amazing, most people could stick their pinky down the 3rd-instar burrow (although I doubt few would have the courage!). I’m glad you explained the mandible asymmetry…that was the first thing I noticed (other than the ginormousness). Gotta love a comment that combines the terms “asymmetry” and “ginormousness”! Not sure if it’s a big deal or not, but I caught a Manticora spec’s(?) at a blacklight in Zimbabwe in 2001. Awesome bugs. Great article as usual, congrat’s on the “gift”. Seems the Tiger Beetles never let you down ! …on numerous nights of collecting insects in Manticora habitats in southern Africa, including the localities of all the populations here studied, no adults were ever seen hunting at night. Similarly, they were never encountered visiting light-traps, as Megacephala often does. It is possible that some nocturnal hunting may take place occasionally, as implied by Roer (1984) and Werner & Wiesner (1995), such as during full moon or following evening rain after a long period of drought, but in general Manticora is active in the early morning and late afternoon and not nocturnal, nor even crepuscular. Lucky you having actually seen one of these in the wild! Wow, can you imagine if there were Methocha specialized for Manticora?! Still trying to get your shipment together. Let me know if there is a drop dead date before you move, but I should be able to get it out this week. No rush at all. It looks like I’m staying put for another six months. Thanks for posting this link – cool larvae information. As for the M. scabra Ted featured today, I’m really liking the face-mouth pix with all the features going on. You’ve probably noticed by now that I’m a sucker for face-on shots. 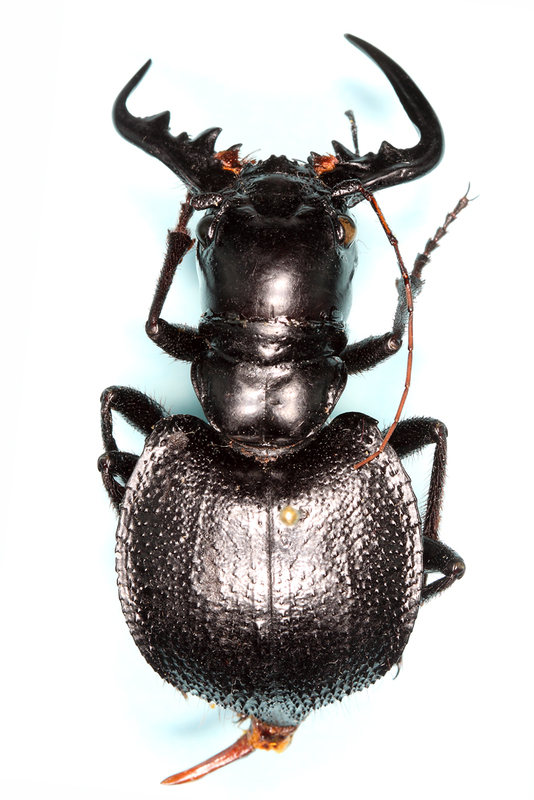 Oooh, great beetle and a really fascinating story about the mandibles, but the Methoca bit is the icing on the cake, especially the correlation of its size with the ginormosity (I think this is, in fact, the correct form of the noun :~} ) of the host! Is there eye color sexual dimorphism, or is that just an artifact of preservation? The white eyes of the female is just an artifact of preservation. I see it every now and then, although I’m not sure what exactly is going on. There are some good ones in your area that I didn’t get a chance to see last year – Cicindela parowana and Cicindelidia willistoni being two that come to mind. Haha they’re already on my tigers of utah checklist. Question: Do you know of any C. duodecimguttata occurring in central California?? Cicindela duodecimguttata occurs east of the Rocky Mountains and is replaced further west by the very similar and closely related C. oregona. Thank you! that’s what i thought it was until i ran it through the key and it appeared not to match up to C. oregona but it did match up with C.duodecimguttata, i’ll take a second look under the scope, strange. In areas where the two species overlap (eastern slope of Rocky Mts) they can be difficult to separate, and hybrids do occur. Outside of this hybrid zone, however, Cicindela duodecimguttata can be distinguished by the distinct marginal white band at the middle of the elytra and at right angles to the middle band. This band is lacking in C. oregona. Amazingly informative…the photos so impressive! I kept a male and female of these beetles a few years ago. Surprisingly, they don’t make very exciting pets. They are extremely timid — freezing if you come near them. The huge jaws — just like the stag beetle’s — are very weak, and useless for defence. Anthia species are much more active and exciting! I’ve collected Anthia in South Africa but, of course, could not bring them back alive to keep as pets. Their jaws may not be as big as Mantichora, but they are every bit as impressive a beast!